Hello friends! I hope you are having a great Saturday afternoon. I am back with a pet grooming video for you guys who also have long haired dogs ( or cats ). First, I would like to point out that I am in no way a professional groomer and my way might not be exactly right. We use to take Super Cooper to get groomed all the time but started to realize we could probably do a pretty good job ourselves at home for a fraction of the price. 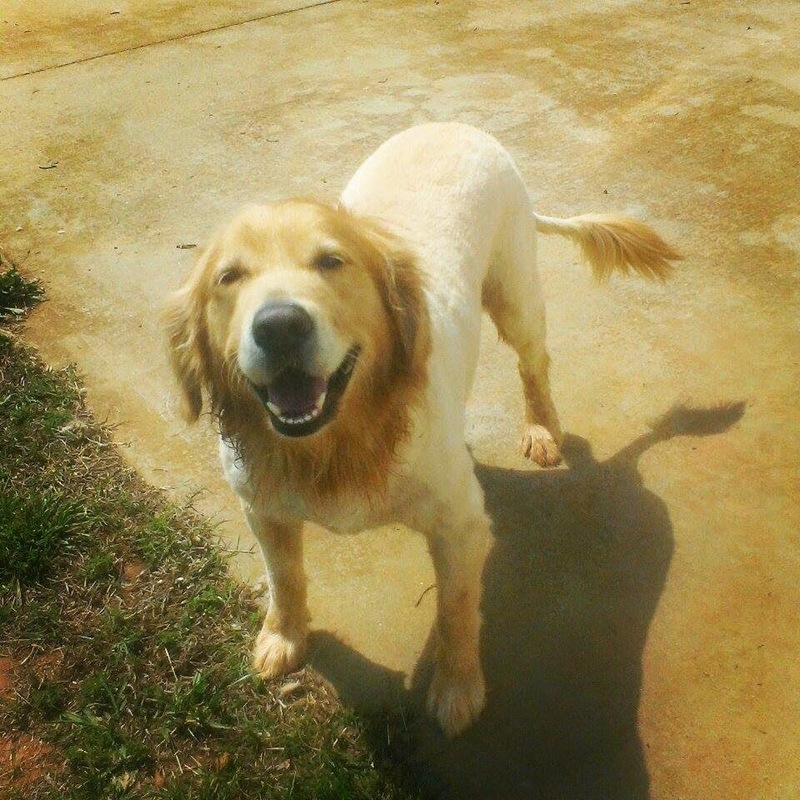 With the warmer weather, its hard on long haired animals and getting a cut always makes our dog feel so much better! You can see exactly how I did it in the video below....if you want skip around because there is a lot of time of me taking the trimmers to Cooper. But if you are wanting to groom your own pet, I seriously would watch it all the way through at least once and be sure to go through notes below! Please remember I am not a groomer...these tips are just my own and hopefully will help you if you decide to do this to your dog and or cat. For Cooper, we like to cut him down at the beginning of summer to make it comfortable on him. Golden Retrievers have a very thick undercoat that is extremely thick and hot. Not to mention the shedding. This may look a little extreme but by October he will be all grown out again. Remember this is hair you are cutting, it will grow back out...even if you make a mistake. Finding a a good spot to cut your dog at home is important. I find the porch works great because for Cooper there is a ton of hair..and I really don't want that mess inside. If you are doing a small dog, it might be best to put a towel out on the kitchen table and do it there to save your back and make it easier. But remember this is a long process, if outside make sure to be in shade with a bowl of fresh water. Before starting anything, try to reassure the dog by having treats on hand, and always talk to your pet as you go along in a calm soft voice. It might be useful if you have a dog who is not calm to have someone else there to help hold them with a leash upright if needed. Cooper just goes along with it because it feels good. Also we started doing this to him each year since he has been 2 years old. The earlier you start, the easier it becomes. Normally though we shave all the hair around his neck but this is a lion cut after all! I didn't mention this in the video but if your dog has any mattes, try to cut them out yourself before shaving. I bought the Oaster Cordless Power Advanced Clipper Set for $49.99. It comes with a DVD and with all the guide combs. These were the best ones at my store but if they had better ones, I would have bought them. I wanted the best I could get at the time, because all of our animals are long haired so I will be using it a lot. After a while the clippers might become hot, so be sure to take breaks, dust them off and put a little oil them from time to time. Also you could use cooking spray...it works great! Another thing to remember is, for a large dog like Cooper, can take up to 3 or 4 hours. So make sure you have the time to do it. Plus there is a lot of hair so skip wearing anything back and be sure to shake your clothes out when done and launder them alone. I like to start on the largest part of the body..the back. Its easier to just let the dog sit and go from there. I started out using the #3 comb but with so much hair to take off, I just went ahead and switched to the #1. Do NOT use the clippers without a guide comb. Shaving right to the skin is just plain ugly and you can easily cut your dog. So always always use a guide comb. The only time I find its ok to not use it is on the pads of their paws. When you are shaving down a big dog, you will have to go over them many many times. There are layers of hair. You will have to find different ways to hold and move around the clippers. The hair grows in all directions and you will have to shave in all different directions. Once you get going, you should get it.. and you can see in the video above how I twist and turn my wrist when shaving him. Be sure to take breaks and use the treats during the grooming process. If its hot out, have water on hand. As you could see in the video, I let cooper lay down when he was tired which was easier to get his belly and back legs. If you have a large pet, after a while they will get tired. Once I get all the thick hair off, I use scissors to trim the long hairs around legs and then I like to rise him off and let him play for a couple of minutes in the sunshine. Once he was dry ( for the most part ) I went back with the clippers across his body again to really get an even cut. Once I am happy with the cut on his body, I remove the guide comb and trim the pads on his paws and brush out the hair around his neck. Then I give one final full bath inside...followed with towel drying... and done! Try not to get too upset if it doesn't turn out exactly how you had hoped. Depending on your dog, and how long you take...it can be hard. Make sure you have the hours to do it well. You can also pick another size guide comb if you don't want such a short cut. For dogs with long hair, it always feels better with a summer cut. Always. The hair will grow back out by winter if you do it late spring or early summer. You can make the hair around the neck more or less depending on your likes. To get the tail with the lion tip, grab a bunch at the end and then start moving the clippers in a downward motion as shown in the video...just kinda taper it down and the shave the top of the tale all the way down with the #1 blade. 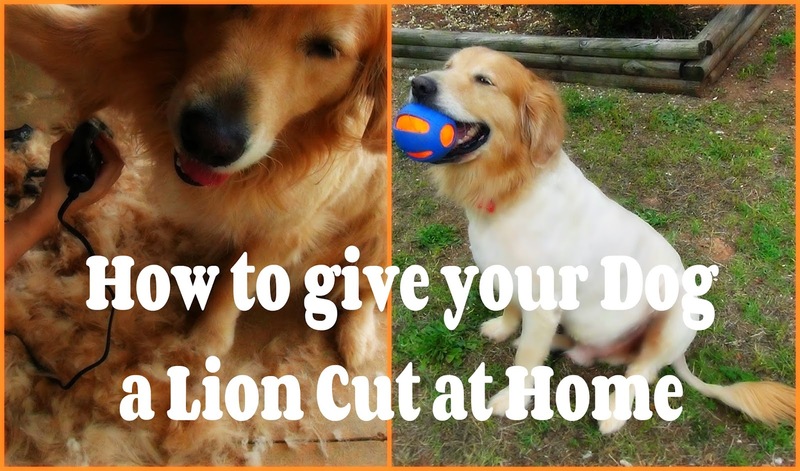 I hope the video and tips are helpful if you are wanting to give your dog a lion haircut. Good luck and if you do give his haircut to your doggie or even kitty cat, please send me a picture or upload it to my facebook fan page. I would love to see it!